Yokohama port centennial parade, 1958, down Basamichi-dori – technically, a year early. (The Port of Yokohama was opened for trade in 1859.) The granite-colored building right-of-center is the present-day Kanagawa Prefectural Historical Museum (before its original copper dome, destroyed in the 1923 Great Kanto earthquake and left unrepaired, was replaced in 1967), the former headquarters of the Yokohama Specie Bank; at left is the former Yokohama branch of Fuji Bank, the present-day location of the Graduate School of Film and New Media. “In Japan, ninety-eight and a half years can be near enough to a centenary, or many seem to think it can, and apparently the Governor of Kanagawa Prefecture and the Mayor of Yokohama did likewise. Indeed I might say most of the important foreign firms in Yokohama and Tokyo appeared to share the view, as I shall shortly demonstrate. 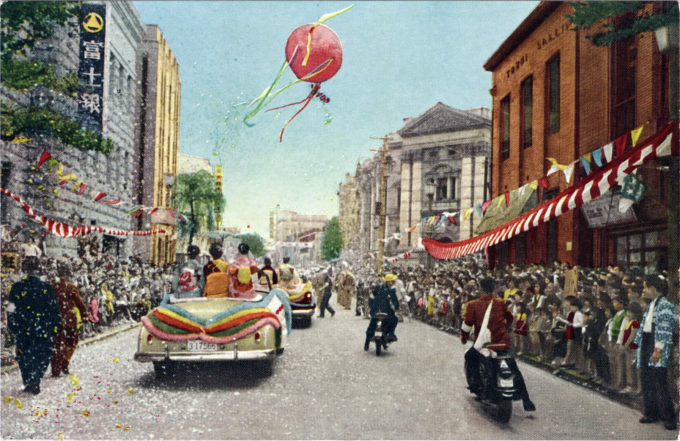 “Yokohama was opened on 1st July, 1859, and yet the City of Yokohama celebrated its centenary in May, 1958, more than a year too soon, despite the fact that the 50th anniversary had been correctly celebrated in 1909. “And so it was that, in May, 1958, on the occasion of Yokohama’s felicitous celebrations of its so-called centenary, the important foreign shipping firms and some other institutions in Yokohama and Tokyo published congratulatory messages in the newspapers on the occasion of what they also described as ‘the 100th anniversary of the opening of the port’ – all in fact except the U.S. Consulate-General in Yokohama. The latter offered congratulations but avoided all reference to the centenary, apparently because it perversely believed that ninety-eight and a bit is not a hundred. ‘The Peninsular and Orient Steam Navigation Company, themselves the oldest Line regularly calling at Yokohama, take this opportunity to express Congratulations and Sincere Thanks to Yokohama Port on its Centenary.